Welcome to our site and today we will show you a important trick that can help you a lot. We are living in a modern world. We don’t communicate with our friends and family with the old ways. We are communicating in this communication world with a lot of modern communication system or through social meida which help us to communicate with our relatives more easily than before. As everything has it’s dark side this modern technologies has the dark side too. It can vanish or suddenly destroy your data which is very important to you. At that situation what can you do ? Of course you have nothing to do. To get rid out from all of this problem today we are here with a cool trick that can reduce you tension about it. The trick name is How To Safe WhatsApp Data With Google Drive. With this trick you will able to safe your chats with a trusted organization. So, let’s find out it. If you want to back up your whatsapp conversation then you are at the right place. 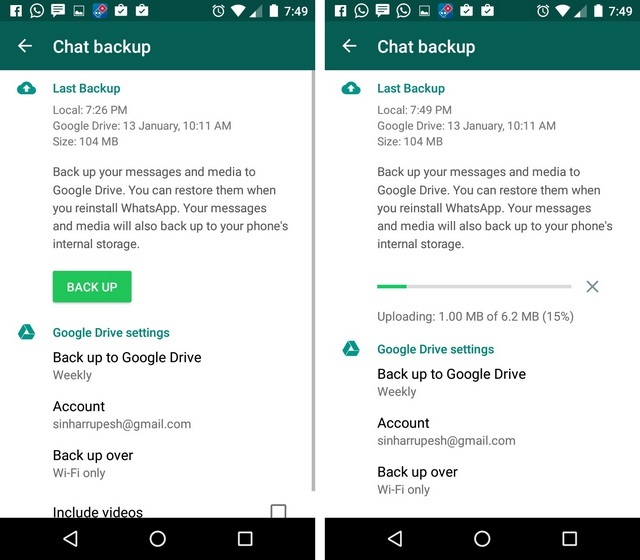 If you switch Android phones or get a new one, your chats and media are transferable and you can back up your chats and media to Google Drive. If your backup files vary in size and may consume mobile data we recommend connecting your phone to Wi-Fi prior to backing up your chats via Google Drive. In order to use Google Drive backup, you need to have the bellow requirements. So, let’s see what’s that. Enough free space on your phone to create the backup. Of course a Google account activated on your phone. Enough free Google Drive space for your WhatsApp chats and media, including videos, photos, audio files and voice messages. Google Play services installed on your phone. But there is thing that you need to know and that is Google Play services is only available for Android 2.3.4 and higher. Bellow we are giving you the steps that how to create a Google Drive backup. To keep your WhatsApp data safe, open WhatsApp on your Android phone. Now you need to go to Menu Button . And from there select Settings . There you can see Chats click on it. Now there select the option Backup To Google Drive and then set the backup frequency of your backup that is either Monthly, weekly and day according to your wish. Here you’ll be asked to select a Google account that will be used to backup your chat. Remember the Google account you are using for the backup. If you do not have a Google account, tap Add account when prompted. And then after clicking on Backup over and set the network type that you want to set for back up. You have done. After all of these steps now your Whatsapp data will automatically backup to your drive. Now you can check your data whenever you need it. Hope you like it. Be stay with us to get more cool trick like this.